Nationally, all minds have focused on Heisman Trophy winner Marcus Mariota and who will fill his giant, humble shoes. 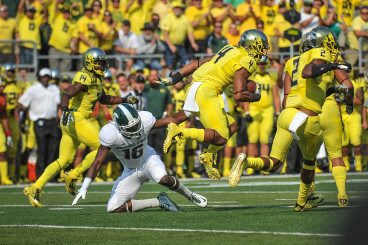 My mind is elsewhere, namely, on the Oregon Ducks defense. The Ducks offense would not be The Duck Offense if it weren’t for the guys on the field the most. Our defense held big, bad Michigan State to 27 points, powerhouse Stanford to 16 points, and flashy Utah to 27 points. Day in and day out, these guys work their tails off. 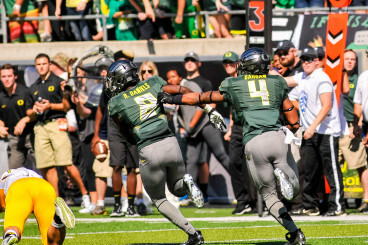 But the departure of seniors like linebackers Derrick Malone Jr. and Tony Washington, safety Erick Dargan, cornerbacks Ifo Ekpre-Olomu and Troy Hill leave empty what are arguably bigger shoes to fill than Mariota’s. Daniels as lead blocker for Dargan after an interception. The old guard has given way to next season’s breakout stars, including linebackers Christian French, Torrodney Prevot, and Joe Walker, safeties Reggie Daniels and Tyree Robinson, and corner Chris Seisay. 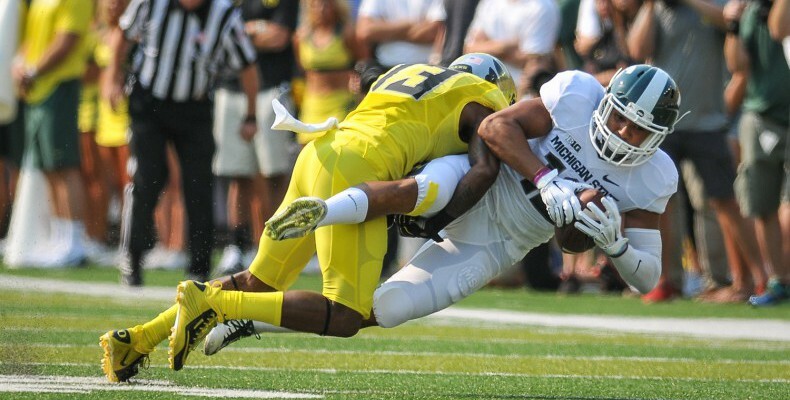 Dargan’s two interceptions vs. Michigan State were crucial to swing the momentum back to the Ducks. Dargan began his career as a star on special teams. Through hard work and patience, he became a starting safety in his final year with the Ducks. His efforts, both on and off the field, will be missed, but the impact of his leadership will be passed on to younger players like Daniels and Robinson. One of several interceptions by Dargan this last season. With returning Pac-12 quarterbacks like Cody Kessler, Jared Goff, Cyler Miles, and Anu Solomon, all of whom are capable of picking apart defenses, the defense will no doubt face a series of difficult tests next year. Tony Washington for the Scoop-n-score in the Rose Bowl this season. 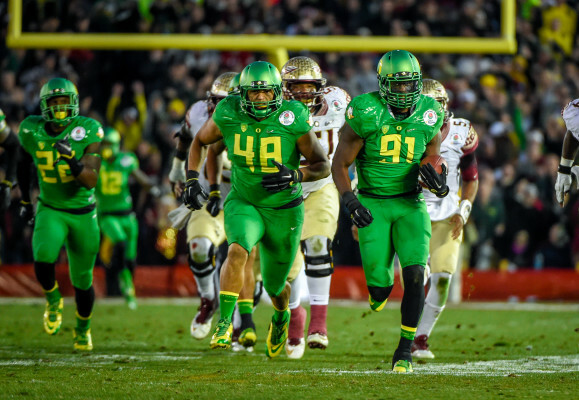 Despite the future challenges, the Ducks’ defensive underclassmen already have experience. Pellum will not be introducing a completely new defense to new players. These talented but unheralded players have seen the playing field and have already made a difference. I am excited to see what happens next year and who takes the field when the Ducks open against Eastern Washington on September 5th. How many more days until kickoff again?